A Tipperary couple who sued Beaumont Hospital in Dublin over a failed living donor kidney transplant has withdrawn their actions against the hospital. Denise Ryan donated a kidney to her husband Pat, who was 22 months on the transplant waiting list, but that transplant failed. Days later he had another transplant from a deceased donor which was successful. The couple had sued over the first failed transplant. On the second day of the case today, Mr Justice Kevin Cross was told the proceedings had been compromised on terms which include the withdrawal of the couple's claims and the case could be struck out. The development came after several hours of talks between the sides. Counsel for Denise and Pat Ryan, Jeremy Maher SC, told Mr Justice Cross the second successful transplant arose from tragic circumstances for another family. Mr Maher said the Ryans wanted to say they were and will continue to be deeply indebted to the family of the deceased donor. Mr Justice Cross said he was happy the proceedings had settled and said it was a difficult case. 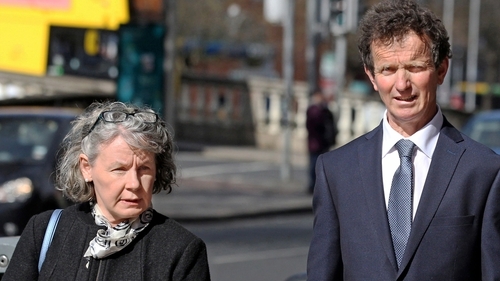 Pat and Denise Ryan, Ballypatrick, Clonmel, Co Tipperary had sued Beaumont Hospital Board over the hospital's care when Ms Ryan's kidney was removed and placed in her husband in a transplant operation at Beaumont Hospital, Dublin on 20 January 2014. It was claimed Mr Ryan was provided with an organ which was not effective and underwent a good deal of mental, distress and an alleged unnecessary and failed operation. It was alleged on Ms Ryan's behalf that following the operation she was advised the transplant did not go well. It was claimed she became depressed and suffered grief for the loss of an organ. Ms Ryan, 51, had claimed she now suffers from post traumatic stress disorder and is without a second kidney and had expected her kidney to live on in her husband. Her 56-year-old husband Pat, who ended up having three operations instead of one, had told the High Court he was very grateful for the second transplant but his wife was devastated. "It was a huge blow to her I had another person's kidney in me," he said. Opening the case Jeremy Maher SC said Mr Ryan, who had kidney problems and had been on dialysis, was on the transplant waiting list for 22 months. Mr Ryan had "waited and waited and waited" for the phone call telling him there was a matching donor kidney but it never came. Counsel said that Ms Ryan was a suitable match. He said a living donation is a routine procedure but one of the disadvantages is the loss of the kidney for a donor and the effects of failure if the transplant is not a success. "Transplant failure can leave the donor suffering psychological injury. It has happened in this case with devastating consequences for the Ryans" he said. Ms Ryan's left kidney was put in her husband's right side. When Ms Ryan woke up, after the operation, she was told there had been difficulties and it came "as a complete shock and caused immediate anxiety." "Denise felt a part of her died. She was concerned her husband was going to die. She felt she had let him down. She thought her kidney was going to live on in her husband," he said.